The New York Daily News now joins that number. The outlet, which operates in print and online, axed half its staff Monday. The New York Daily News (NYDN) was once the most widely circulated paper in the United States on a daily basis, employing hundreds in its newsroom. But readership dwindled. The newspaper, which was founded nearly 100 years ago in 1919, became the ninth-most widely circulated daily paper in the US in 2016. 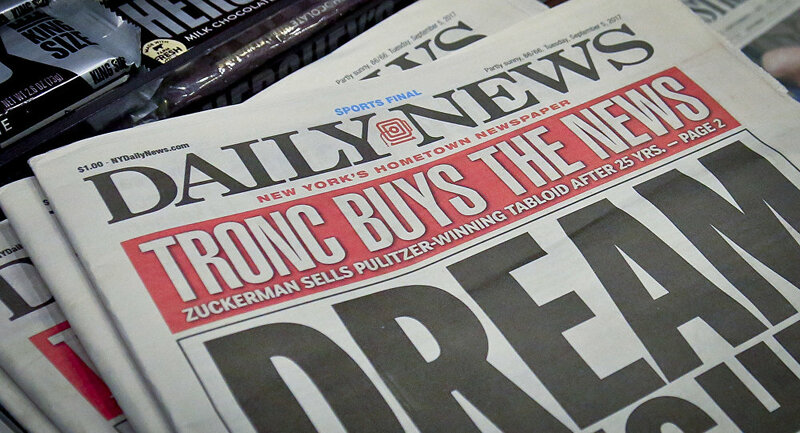 In 2017, the paper was bought out by Tronc, the third-largest newspaper publisher in the US, reportedly for just one dollar. Tronc also publishes the Chicago Tribune, Orlando Sentinel and the Baltimore Sun. Prior to a one-minute meeting on Monday morning, the NYDN employed just 75 to 100 staff members. In a now-deleted Tweet, the organization posted just a GIF of the oft-used "confused John Travolta." According to Pew, which released its findings the same day the NYDN announced its layoffs, 36 percent of daily newspapers with Sunday circulations exceeding 50,000 — in addition to the Wall Street Journal, which isn't circulated on Sunday — have recently experienced layoffs. Twenty of the 110 daily newspapers examined experienced more than one round of layoffs. NYDN also saw dozens laid off in a separate round in 2015. And while newspaper dailies are declining, the alternative weekly format was eulogized in 2017 by Politico magazine, The Guardian, City Lab, the Washington Post and Reason. Pew also tallied layoffs at news websites with a monthly average of at least 10 million unique visitors in the same January 2017 to March 2018 time period, of which there were 35; 23 percent saw layoffs in those 16 months. And the figures calculated by Pew come only from publicized layoffs, so the numbers may be greater, considering that many layoffs do not receive coverage. According to the Bureau of Labor Statistics, newspaper newsrooms have seen staffing drop by 15 percent between 2014 and 2017. Newspapers have struggled to keep up with rapidly changing trends in news consumption. In other words, people are getting their news online. In that realm, outlets are in stiff competition with one another for clicks, and revenue from advertisements is hardly enough to sustain a fully staffed newsroom.